Just in time for the start of the GP Ice Race, Porsche Design launches a special edition timepiece from the iconic Chronotimer collection, as the official timing partner for the 2019 event. The Chronotimer GP Ice Race Special Edition was designed exclusively for the historic ice race, being revived after nearly 45 years. Taking place in Zell am See, Austria from January 19th to 20th, the legendary multi-class event offers amateur and professional riders, teams, and manufacturers the opportunity to compete under the toughest conditions for two days on the frozen race track. The event also includes the traditional skijoring and performances by famous race drivers. Performance is everything in motorsport. The same is true of time measurement, particularly short-term measurement. Porsche Design is the intersection of these worlds. As a precise and reliable instrument, the chronograph is designed to measure top-class performance and best times. Every second counts – just like on the race track. Since the foundation of Porsche Design in 1972, the company has been rooted in Zell am See. The Chronograph I, the first watch designed by Professor Ferdinand Alexander Porsche and his team in 1972, was a world first. Inspired by a decade-long experience in motorsport, it was the first all-black wristwatch ever made. To guarantee intuitive legibility from every angle at any time, the dashboard instruments of Porsche sports cars are matte black, having little to no reflection. The same principle was successfully transferred to this timepiece. The next milestone followed in 1980 when the exclusive lifestyle brand incorporated Porsche’s lightweight construction principle to the world of watches with a timepiece made entirely of titanium. In addition to being hypoallergenic, it offered unparalleled lightness and durability. The Chronotimer Collection’s style refers to the Chronograph I and highlights the brand’s roots in motorsport. As the latest addition, the Chronotimer GP Ice Race Special Edition embodies the spirit of Porsche and pays tribute to the first Porsche Design Chronograph from 1972. 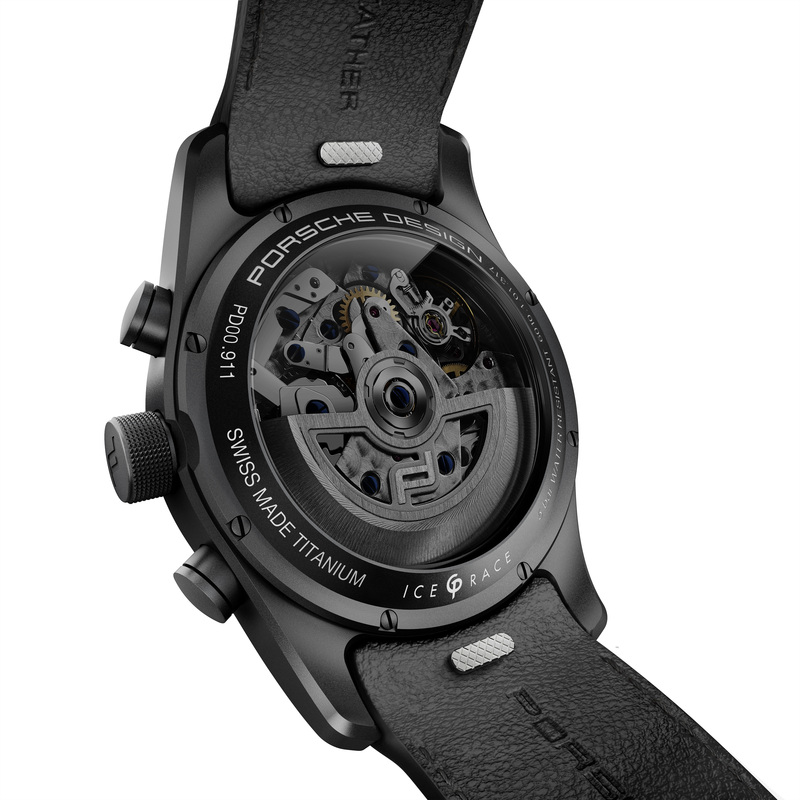 Like all Porsche Design timepieces, the 42-mm case is made of lightweight, resilient titanium. The characteristic black titanium carbide coating accentuates the expressive sporty design. The matte black dial, focused on perfect legibility, has a deeply dynamic look. The GP Ice Race logo pays tribute to the rebirth of the legendary race, and the ice-blue and polar-white accents refer to the difficult conditions on the icy race track. Behind the case back’s blackened sapphire crystal, classic Swiss watchmaking puts the pedal to the metal: the automatic calibre ETA Valjoux 7750, which powered the Chronograph I. This version is equipped with the personalized Porsche Design Icon rotor. The inscription “GP ICE RACE” on the case back also highlights the exclusivity of the timepiece. The watch’s harmonious color composition also includes the strap. Made of original, high-quality Porsche interior leather and distinguished by white contrast stitching, it perfectly complements the balanced design.